Does Facebook care about privacy? It’s unbelievable how little they seem to do. Does Facebook really care about privacy? It’s unbelievable how little they seem to. Facebook has about 1,3 billion users, 864 million of whom are daily visitors. Facebook is now collecting and analyzing data about millions of user interactions every second — about our friends, our interests and our everyday behavior. In 2014 they even acquired Whatsapp and Instagram, and thus added millions of additional user profiles. 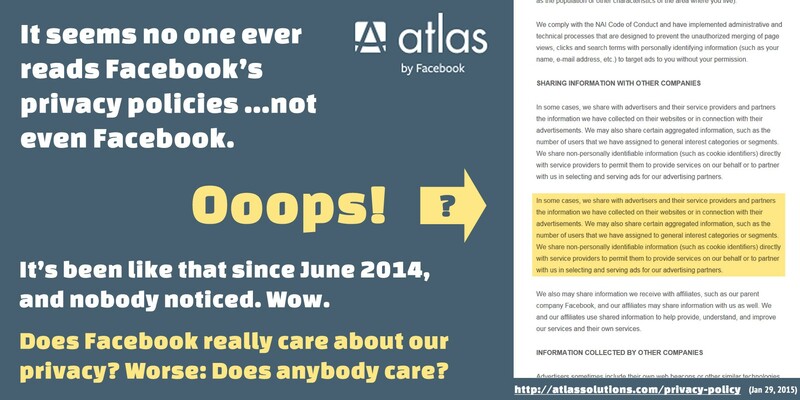 Recently, Facebook also acquired Atlas, a gigantic internet ad server, and according to Business Insider, one of the least well understood parts of Facebook’s business. According to Facebook’s new data policy, which will take effect on January 30, 2015, Facebook will share all of its data about users with all of its other companies. One of them is Atlas. It’s been like that since June 2014, and nobody noticed. Wow. Come on! This is not a tiny little startup. Researcher, activist, co-creator of @datadealer, based in Vienna. Online Tracking, Big Data, Surveillance, Personal Data, Privacy, Open Source, Open Knowledge.